As Tuco said when he got the drop on Clint Eastwood in The Good, the Bad and the Ugly, "There are two kinds of spurs, my friend. Those that come in by the door [crosses himself], and those that come in by the window." The Rockies came in the latter way, beating the Diamondbacks 4-3 on Sunday to force the unlikliest of one-game playoff showdowns for the final spot in the NL postseason field. And so it shall come to pass, Padres vs. Rockies at the Coors Field Thunderdome, today, 7:35 p.m. ET The Padres have their Patron Saint, Jake Peavy, on the mound; praise be to his 10-1 record over his past 11 starts. But the Rockies — winners of 13 of their past 14 to earn a ticket to this dance — have their own guardian angel. He's blond, bespectacled, has a high-pitched voice and is on excellent terms with the Almighty; at least if one can believe the movie Oh, God, anyway. Yes, I speak of course of John Denver, who is obviously guiding the Rockies' fortunes from above. 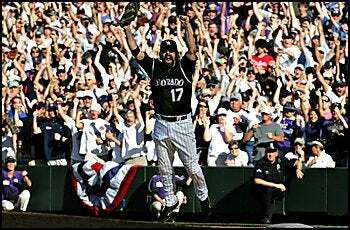 This is the 10-year anniversary of the month that Denver died in a plane crash, leaving little doubt that the Rockies would reach October. One could hear Denver singing the strains of I Guess He'd Rather Be In Colorado as San Diego was losing to the Brewers, 11-6, to force the playoff. The Rockies have been to the postseason just once, in 1995. Colorado went 71-46 after May 22, when they were 8½ games back in the wild card race. That record was second only to the Yankees (74-45). Peavy is 0-0 with a 1.29 ERA in two starts against the Rockies this season. He is 4-4 lifetime against the Rockies, 3-3 with a 3.96 ERA at Coors Field. Colorado will counter with Josh Fogg, aka Dragonslayer, for his propensity to beat the other team's ace. Fogg is 1-1 with a 6.28 ERA in three starts against the Padres in this season. So anyway, this should be fun. • The Philadelphia Story. We'll have more on this later — including detailed analysis from the Mets' perspective — but may I just say how happy I am that players from the winning team in the NL East celebrated by dousing their fans with a fire hose? You so rarely see that in sports anymore. Shane Victorino and Antonio Alfonseca did the honors after the Phillies beat the Nationals 6-1 on Sunday, which coupled with New York's 8-1 loss to the Marlins, allowed the Phillie Phanatic to climb those Rocky Balboa steps and dance a victory dance. The Phillies advance to the postseason for only the 10th time in their history, and will play host in Game 1 on Wednesday against the winner of today's wild-card tiebreaker between San Diego and Colorado.